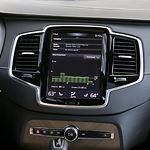 In addition to tweeters, the Volvo XC90 audio system includes low range speakers. This lower frequency speaker set includes special subwoofers that use air ventilation technology to clearly transmit even very low sound ranges. Plus, this system allows users to choose from one of three special room modes that enhance the overall listening experience.